For the museum, see Cinquantenaire Museum. Parc du Cinquantenaire (French for "Park of the Fiftieth Anniversary", pronounced [paʁk dy sɛ̃kɑ̃tnɛʁ]) or Jubelpark (Dutch for "Jubilee Park", pronounced [ˈjybəlpɑrk]) is a large public, urban park (30 hectares) in the easternmost part of the European Quarter in Brussels, Belgium. Most buildings of the U-shaped complex which dominate the park were commissioned by the Belgian government under the patronage of King Leopold II for the 1880 National Exhibition commemorating the fiftieth anniversary of Belgian independence. During successive exhibitions in the same area, more structures were added. The centrepiece triumphal arch was erected in 1905 replacing a previous temporary version of the arcade by Gédéon Bordiau. The structures were built in iron, glass and stone, symbolising the economic and industrial performance of Belgium. The surrounding 30-hectare park esplanade was full of picturesque gardens, ponds and waterfalls. It housed several trade fairs, exhibitions and festivals at the beginning of the century. In 1930 the government decided to reserve Cinquantenaire for use as a leisure park. The Royal Military Museum has been the sole tenant of the northern half of the complex since 1880. The southern half is occupied by the Jubelpark museum (Cinquantenaire Museum) and the AutoWorld Museum. The Temple of Human Passions, a remainder from 1886, and the Great Mosque of Brussels from 1978 are located in the north-western corner of the park (see map below). Line 1 of the Brussels Metro and the Belliard Tunnel from Wetstraat pass underneath the park, the latter partly in an open section in front of the Arch. 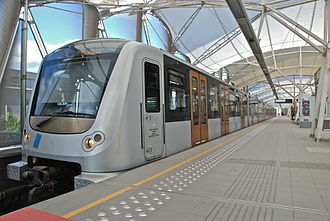 The nearest metro stations are Schuman to the west of the park, and Mérode immediately to the east. The inauguration of the Park at the 1880 National Exhibition. Notice the substitute arch, the intact southern Bordiau wing, Quenast Columns and frontmost fountain. The patriotic celebration of the fiftieth anniversary of the Belgian independence, Parc du Cinquantenaire, 16 August 1880. 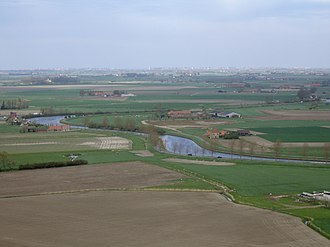 Originally this area was part of the military exercise ground outside of the center of the city, the so-called "Linthout" plains. For the National Exhibition of 1880, the plain was developed as an exhibition center. The original pavilions of the 1880 exhibition, designed by Gédéon Bordiau, were largely replaced with the triumphal arcade designed by Charles Girault in 1904 and the large halls on both sides. Only the glass-constructed Bordiau halls remain from the 1880 structures. The Arch was planned for the exhibition of 1880 and was meant to commemorate the 50th anniversary of the independence of Belgium. In 1880, only the bases of the columns were completed and, during the exhibition, the rest of the arch was constructed from wooden panels. During the following years, the completion of the monument was the topic of a continuous battle between King Leopold II and the Belgian government, which did not want to spend the money required to complete it. The park was also the site of the Brussels International Exposition (1897), for which the building wings were extended, although the arch was still incomplete. The monument was completed with private funding in 1905, just in time for the 75th anniversary of the Belgian independence. The esplanade in front of the Arch. In the plans mentioned below, the Belliard Tunnel would be enclosed. Today the various buildings of the Jubelpark (Cinquantenaire) host three musea and one mosque (see below). The surrounding park esplanade is used for several purposes in the summer, such as military parades and drive-in movies. It is also the starting point for the 20 km of Brussels, an annual run with 30,000 participants. At the exhibition of 1910, a section of military history was presented to the public and met with great success. Given the enthusiasm of the population, the authorities established a museum of the army. 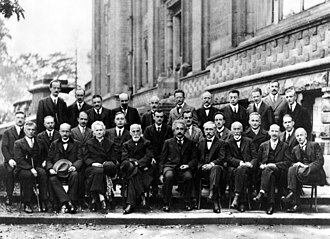 This was in a period of extreme tension which led to the Great War. The museum was originally installed at the Abdij Ter Kameren/Abbaye de la Cambre and moved to Jubelpark/Cinquantenaire Park in 1923. The museum's collection was dominated by approximately 900 pieces collected by the officer Louis Leconte following the Great War. It has been enriched by legacies, gifts and exchanges. Louis Leconte collected considerable equipment abandoned by the Germans in 1918. Today, the museum displays uniforms, weapons, vehicles and military equipment of all ages and all countries. The north wing, built by Gideon Bordiau, has been occupied by the aviation hall since 1972, when the Air and Space division was inaugurated. The collection includes various types of aircraft, with some dating to the beginning of the twentieth century. The collection as a whole is one of the largest in the world. The Jubelpark museum/Cinquantenaire Museum is an art and history museum that occupies most of the southern part of the complex. It is part of the Royal Museums for Art and History. This is a Belgian federal institute of the Belgian Federal Science Policy Office. The museum consists of several parts, which include a national collection of artifacts from prehistory to the Merovingian period (751 AD), and a collection of artifacts from the antiquity of the Near East, Egypt, Greece and Rome. Artifacts from non-European civilisations, such as China, Japan, Korea, pre-Columbian America, and the Islamic world, are also on display. A collection of European decorative arts includes pieces from the Middle Ages to the 20th century. This includes sculptures, furniture, tapestries, textiles, costumes, old vehicles etc. AutoWorld is a vintage car museum that occupies the southern hall of the complex. It holds a large and varied collection of 350 oldtimers, European and American automobiles from the late 19th century to the 1970s. These include Minervas, a 1928 Bentley, a 1930 Bugatti and a 1930 Cord, and several limousines which belonged to the Belgian royal family. The Great Mosque of Brussels is located in the north-western corner of the park. It is the oldest mosque in Brussels, and is the seat of the Islamic and Cultural Centre of Belgium. The latter operates a school and an Islamic research center. The centre provides courses of Arabic to adults and children, as well as initiations to Islam. The original building was built in 1880 by architect Ernest Van Humbeeck in an Arabic style, to form the east pavilion of the National Exhibition. for the exhibition, the pavilion housed a monumental fresco, “Panorama of Cairo,” which was a major success. Insufficient funds for maintenance during the period of the world wars caused the building to gradually deteriorate. In 1967, during an official visit to Belgium from King Faisal ibn Abd al-Aziz of Saudi Arabia, King Baudouin decided to adapt the building as a place of worship. The mosque, designed by Tunisian architect Mongi Boubaker, was inaugurated in 1978 in the presence of Khalid ibn Abd al-Aziz and Baudouin. It was featured in the SimCity (2013 video game). Jubelpark/Cinquantenaire is envisioned to be 'Europeanised', and its North Hall (pictured) could possibly be turned into a major "socio-cultural facility". In September 2007, the European Commissioner for Administrative Affairs Siim Kallas, together with Minister-President of the Brussels-Capital Region Charles Picqué, unveiled plans for rebuilding the European district. They included 'Europeanising' parts of the Jubelpark/Cinquantenaire complex, and installing a major "socio-cultural facility" in the North Hall, enabled to hold "major congresses and, perhaps, European Summits, events, exhibitions", after moving the Aerospace Museum out to Tour & Taxis in the north of the city. The Jubelpark/Cinquantenaire would under the plans become one of three European pedestrian squares, being the one for events and festivities. Wider development surrounding the complex involves a new metro station called Jubelpark/Cinquantenaire and an underground car park. ^ a b "Cinquantenaire buildings". AutoWorld. Retrieved 2008-07-05. 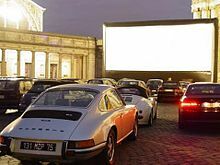 ^ "Drive-In Movies Is Celebrating Its 20th". BrusselsLife. Archived from the original on 2012-07-29. Retrieved 2008-08-01. ^ "EU promises 'facelift' for Brussels' European quarter". EurActiv. 2007-09-06. Retrieved 2007-09-27. Wikimedia Commons has media related to Cinquantenaire. Arcade du Cinquantenaire or Arcades du Cinquantenaire is a monumental triple arch in the center of the Cinquantenaire park in Brussels, Belgium. It is topped by a bronze sculptural group with a woman charioteer. The columns echo the original layout of Avenue de Tervuren, which was divided into three roadways lined with a double row of trees. The sidewalls feature personifications of Belgian provinces, Brabant being represented by the quadriga, East Flanders, West Flanders, Antwerp, Liège, Limburg, twelve spandrels are decorated with allegories of Arts and Industry. 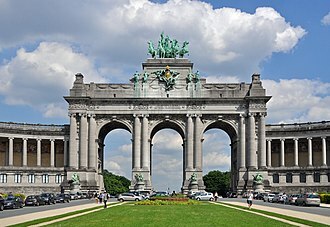 The arch was a part of a project planned by Leopold II of Belgium, the idea of the arch was originally conceived by Gédéon Bordiau, but upon his death in 1904 the archs design was revised by Charles Girault. 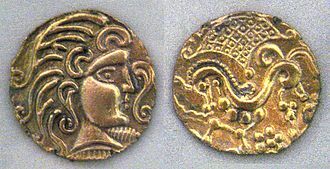 Girault designed an arcade, but preserved Bordiaus idea of the quadriga. The foundation of the arch was laid down on 4 January 1905, in 1912 the colonnades interior was decorated with the mosaic by Jean Delville. He was joined by other artists. Leopold II was the second King of the Belgians, known for the founding and exploitation of the Congo Free State as a private venture. Born in Brussels as the son of Leopold I and Louise of Orléans, he succeeded his father to the Belgian throne in 1865. His was the longest reign of any Belgian monarch and he died without surviving male issue, the current Belgian king descends from his nephew and successor, Albert I. Leopold was the founder and sole owner of the Congo Free State and he used explorer Henry Morton Stanley to help him lay claim to the Congo, an area now known as the Democratic Republic of the Congo. At the Berlin Conference of 1884–1885, the nations of Europe authorized his claim by committing the Congo Free State to improving the lives of the native inhabitants. From the beginning, Leopold essentially ignored these conditions and he ran the Congo using the mercenary Force Publique for his personal enrichment. He used great sums of the money from this exploitation for public and he donated the private buildings to the state before his death, to preserve them for Belgium. Under his regime millions of the Congolese people died, modern estimates range from 1 to 15 million, human rights abuses under his regime contributed significantly to these deaths. Leopold was born in Brussels on 9 April 1835 and he was the second child of the reigning Belgian monarch, Leopold I, and his second wife, the daughter of King Louis Philippe of France. 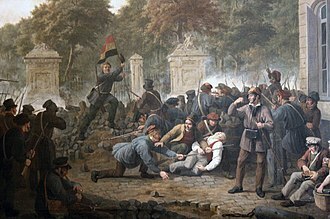 The French Revolution of 1848, which spared Belgium, had forced Louis Philippe to flee to the United Kingdom, the royal families of Belgium and the United Kingdom were linked by numerous marriages, and were additionally both descended from the House of Saxe-Coburg and Gotha. Louis Philippe died two years later, in 1850, Leopolds fragile mother was deeply affected by the death of her father, and her health deteriorated. She died that year, when Leopold was 15 years old. Three years later, in 1853 at the age of 18, Marie Henriette was a cousin of Emperor Franz Joseph I of Austria, and granddaughter of Leopold II, Holy Roman Emperor through her father, Austrian archduke Joseph. The Great Mosque of Brussels is the oldest mosque in Brussels. It is located in the Cinquantenaire Park and it is the seat of the Islamic and Cultural Centre of Belgium. The original building was built by architect Ernest Van Humbeek in an Arabic style, at that time the pavilion housed a monumental painting on canvas, “Panorama of Cairo”, by the Belgian painter Emile Wauters, which enjoyed major success. However, lack of maintenance in the twentieth century caused the building to deteriorate gradually, the buildings was turned into a place of worship for the use Muslim immigrants to Belgium, which at the time were notably from Morocco and Turkey. The mosque, after a reconstruction carried out at the expense of Saudi Arabia by Tunisian architect Boubaker, was inaugurated in 1978 in the presence of Khalid ibn Abd al-Aziz. Imams and officials have come out to repeat the message that Islam is a religion of peace and has nothing to do with the terrorists in the aftermath of the November 2015 Paris attacks. 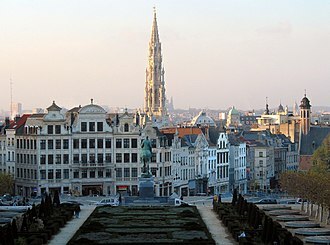 Brussels, officially the Brussels-Capital Region, is a region of Belgium comprising 19 municipalities, including the City of Brussels which is the capital of Belgium. The Brussels-Capital Region is a part of both the French Community of Belgium and the Flemish Community, but is separate from the region of Flanders or Wallonia. The region has a population of 1.2 million and an area with a population of over 1.8 million. Brussels is the de facto capital of the European Union as it hosts a number of principal EU institutions, the secretariat of the Benelux and the headquarters of the North Atlantic Treaty Organization are located in Brussels. Today, it is considered an Alpha global city, historically a Dutch-speaking city, Brussels has seen a language shift to French from the late 19th century onwards. Today, the majority language is French, and the Brussels-Capital Region is a bilingual enclave within the Flemish Region. All road signs, street names, and many advertisements and services are shown in both languages, Brussels is increasingly becoming multilingual with increasing numbers of migrants and minority groups speaking their own languages. The most common theory of the origin of Brussels name is that it derives from the Old Dutch Broekzele or Broeksel, meaning marsh, Saint Vindicianus, the bishop of Cambrai made the first recorded reference to the place Brosella in 695 when it was still a hamlet. The origin of the settlement that was to become Brussels lies in Saint Gaugericus construction of a chapel on an island in the river Senne around 580. The official founding of Brussels is usually situated around 979, when Duke Charles of Lower Lotharingia transferred the relics of Saint Gudula from Moorsel to the Saint Gaugericus chapel, Charles would construct the first permanent fortification in the city, doing so on that same island. Lambert I of Leuven, Count of Leuven gained the County of Brussels around 1000 by marrying Charles daughter, as it grew to a population of around 30,000, the surrounding marshes were drained to allow for further expansion. The Counts of Leuven became Dukes of Brabant at about this time, in the 13th century, the city got its first walls. The Brussels International Exposition of 1897 was a Worlds fair held in Brussels, from May 10,1897 through November 8,1897. There were 27 participating countries, and an attendance of 7.8 million people. The main venues of the fair were the Cinquantenaire Parks and a section at Tervuren showcasing King Leopold II of Belgiums personal property. The two exposition sites were linked by a purpose-built tramway, the Tervuren section was hosted in the Palace of the Colonies, designed by Belgian architect Albert-Philippe Aldophe. In the main hall Georges Hobé designed a distinctive wooden Art Nouveau structure to evoke the forest, using Bilinga wood, an African tree. The interior exhibition displayed ethnographic objects, stuffed animals and in the Hall of the Great Cultures Congos most important export products were displayed, cacao, in the park, an example Congolese village was built, where 267 Africans lived through the period of the fair. The success of this led to the permanent establishment of the Royal Museum for Central Africa in 1898. A triumphal arch is a monumental structure in the shape of an archway with one or more arched passageways, often designed to span a road. The main structure is decorated with carvings, sculpted reliefs. More elaborate triumphal arches may have multiple archways, Triumphal arches are one of the most influential and distinctive types of architecture associated with ancient Rome. The survival of great Roman triumphal arches such as the Arch of Titus inspired many states and rulers, up to the present day. Triumphal arch is the given to the arch above the entrance to the chancel of a medieval church where a rood can be placed. The origins of the Roman triumphal arch are unclear, Triumphal arch look similar to Mesopotamian Arch entrances like the Ishtar Gate but there is no evidence to support that the Romans got their influence from there. The development of the arch is often associated with ancient Roman architecture. To fully understand this development however it is important to understand the importance of basic arches in Roman civilization, the Romans had learned how to construct effective arches from the Etruscans, who lived in central Italy. This knowledge had a impact on the architecture of Roman civilization. As a result, the Romans used arches for things such as aqueducts, amphitheaters and they had effectively used the arch in various aspects of their civilization and city structure. Since the Romans had effectively perfected this architectural structure, one could conclude that the arch symbolized perfection, monumental gateways had already been in use for hundreds of years by civilizations such as the Hittites, Assyrians and Myceneans. There were precursors to the arch within the Roman world, in Italy. Surviving examples of Etruscan arches can still be seen at Perugia, the two key elements of the triumphal arch – a round-topped arch and a square entablature – had long been in use as separate architectural elements in ancient Greece. Entablatures were a part of the structural fabric of such buildings. The great innovation of the Romans was to combine a round arch, the first recorded Roman triumphal arches were set up in the time of the Roman Republic. Old station platform, now being replaced by renovations to expand station. Hansen Field at Western Illinois University in Macomb, Illinois incorporates an all-weather running track. Aerial view of the European Quarter. The Wetstraat/Rue de la Loi (pictured, 2009) is set to be rebuilt with taller and more open buildings. The entrance to the northern Bordiau hall. The North Hall hosts the permanent aviation exhibition. The South Hall of the Cinquantenaire complex, also called Palais Mondial, houses the Automobile Museum. Statue of Ambiorix in the main square of Tongeren. Cherries, an important product of Limburgian fruit growing business. 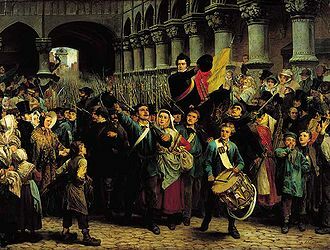 Belgian rebels on the barricade of the Place Royale facing the Parc de Bruxelles in Brussels (1830).